Providing two features in one device, the personalised Dermot Bluetooth Power Bank Speaker is the ultimate travel accessory. 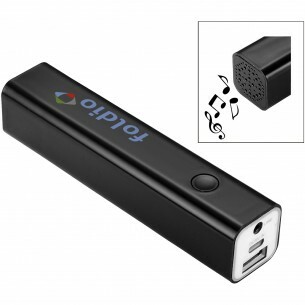 Not only does it provide a 2W Bluetooth speaker, but it also packs in a 2200mAh power bank. Now your customers can charge their devices as well as listen to their music wherever they are. It comes with a Micro to USB charging cable, and it is also packaged in a gift box.